There are people who grasp each problem within Toyota, to state that Lean now really is out of date. Others fight tooth and nail to defend the production system of the Japanese car manufacturer. Both attitudes are rather peculiar. What we call Lean today, is no more or less then the state-of-the-art to deliver good quality products or services on time, and at the lowest possible cost. So, even if Toyota fails, this does not mean that Lean comes to an end. Regardless of how well Toyota is doing, our view on smart production will continue to evolve, like it did during the last century. Nowadays, the attention for the organisational side of Lean increases. How can I make problem solvers of all my employees, is a question that many Lean researchers try to answer. Besides that it catches the eye that Lean turns out to be applicable in an increasing number of organization types. Even design to order production and administrative processes can be made Lean. This is also a matter of evolution, since Lean is adapted to match with these new environments. There is rather large group of people, especially on the internet, who seize every opportunity to declare that Lean manufacturing now really is outdated. Because Toyota is the textbook example of Lean, this company is invariably their target. About 1,5 year ago, there was much noise around the recall of millions of cars. Articles appeared with titles like ‘Toyota Production System of its stroke.’ You could say that there was a small element of truth in that. However, the blogs I read after the earthquake in Japan where really over the line. Toyota would have been hit extra hard by this natural disaster, because of their low inventory. Conclusion: Lean is no good. Grasping natural disasters to discredit companies is in my opinion condemnable anyway, but besides that, the reasoning in those blogs is wrong. After all, how should a company prepare itself for the possibility of an earthquake of 8,9 on the Richter scale, or a simular catastrophy? When you have suppliers near the sea, this would mean that you should built up inventory as a safeguard against a possible flooding, even if the dikes are strong. Is this what you will propose in the next management meeting? Regarding the recalls mentioned above, Toyota learned a lesson. Their principle of self-reflection – when a problem arises: stop, think and improve – must be extended to the customer. The possibilities of fast feedback by the end-users are now being improved. 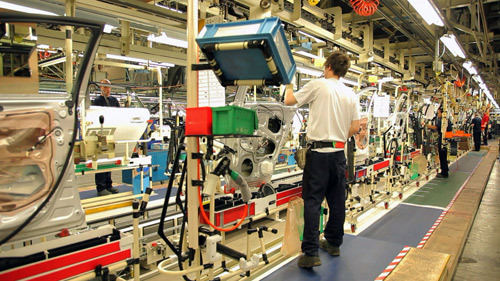 The famous Andon-system of Toyota, which gives operators the possibility to stop the production if they think there might be a quality problem, is more or less extended to the customer. Doing this will not be easy, since consumers think differently then operators. Emotions, highly influenced by the media, play an important role. And what an employee of Toyota never does – jump to conclusions – those media do. This was also an important lesson learned by the car manufacturer. However, it is clear that the Toyota Production System (TPS) still stands up. There was another thing which caught my eye during the last year. Some consultants proved to fight tooth and nail to defend the TPS. It seemed they linked the justification of their entire consultancy practice with the survival of Toyota. Is it really necessary that Toyota remains flourishing, when you are and want to stay a Lean consultant? No. Even if Toyota fails completely, this does not mean that Lean manufacturing comes to an end. Why? Because Lean is no more or less than a catch-all term, describing what we – at this moment – think is the optimal way to deliver good quality products on time, and at the lowest possible cost. The description of what Lean is and how it should be applied has evolved over time and will continue to do so. Fact is, that what we call Lean was adapted over time to cope with changing market conditions. Lean can be seen as a logistic science, which grows but cannot be completely falsified. Until recently, most research focused on the technical side of Lean, the application of tools like value stream mapping and 5S. Now, the attention for what you can call the people part or the organizational or management side is increasing. I will return to that later. During the development of what we call Lean today (and possibly different later! ), time after time different companies took the lead. One of the first insights was, that it is the output towards the consumer that matters in manufacturing. To increase that, you should produce in flow. Undoubtedly, the ancient Romans and Greeks must have developed smart production methods. However, the oldest documented case of flow production is the – literally! – streaming assembly of warships in Venice. First, the hull of such a ship was built. After this, the hull was sailed along several standardized assembly stations. At the peak of the production there were 16.000 people working in the shipyard and a new ship was finished every day. In large, this explains the power of the small Venice in those days. 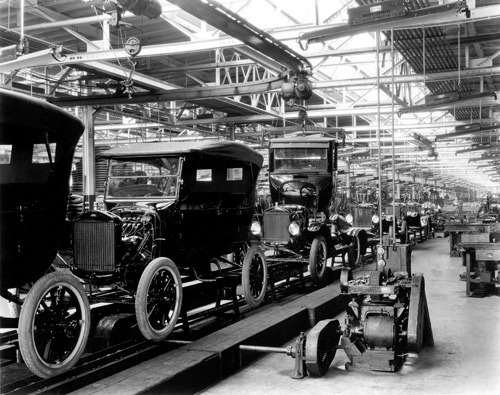 In the beginning of the twentieth century, the baton in developing lean was taken over by Henry Ford. In 1914 he invented the first moving assembly line. After a while, this line could convert rough iron into a T-Ford in the even today amazing time of only 33 hours! How far Henry Ford pushed the idea of flow production, is demonstrated by a factory with multiple floors. The idea was that materials would flow top-down from floor to floor, and finally reach the end-product on the ground. Though this intriguing factory was built, production in it never took place. 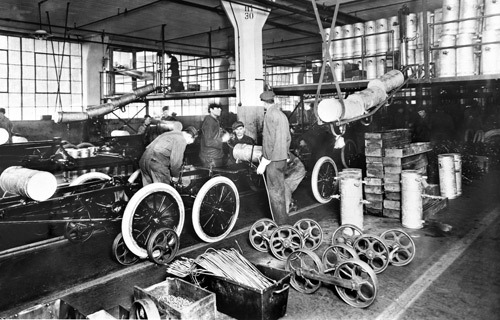 The development of the now famous Toyota Production System (TPS) began around 1950. The most important contribution to Lean as a science was that Toyota adapted Ford’s streaming production. As a result, it became possible to make multiple types of cars with one assembly line. To realize that all existing logistic knowledge was used and combined. One building block was the Training Within Industry (TWI) program. TWI was developed during WOII in American factories. The goal was to quickly train new workers, as a replacement for employees who had left as soldiers. TWI introduced for the first time a scientific approach to process improvement. Today, this approach is known as PDCA, or plan-do-check-act. Many more things where integrated and reused in the TPS, among others the taktzeit. This concept was introduced in the thirties, in the German aircraft industry. The taktzeit determined the rhythm in which airplanes had to be passed on to the next workstation, with the aim to create a smooth production flow. The examples above show that the roots of Lean manufacturing are not typical ‘Toyotan’ or Japanese. In addition, they demonstrate that Lean is not something static, but a product of an ongoing evolution. Therefore it is possible and even likely that in time not Toyota but another company will be mentioned as shining example of Lean! While Lean itself continues to evolve, also our thoughts of what exactly is the core of it will keep changing. In the eighties, the American scientists Womack and Jones introduced the term ‘lean manufacturing’ to describe the way in which Toyota had adapted the flow production of Ford. Lean literally means production with as little resources as possible, thus with few inventory and waste. Although Womack and Jones also stressed the importance of creating flow, from that moment on Lean was often defined as a method aimed at reducing waste and idle time. What is often forgotten, is that eliminating waste is not the ultimate goal of Lean. The real goal stays to maximize the value which streams towards the customers! Modern definitions of Lean, as in the article Standing on the shoulders of Giants of Eliyahu Goldratt, point back to the roots of Lean in Venice and the old factories of Ford. In that case, Lean is defined as a method which maximizes the flow, at lowest possible cost. To increase the value stream, bottlenecks in the production (which could limit the flow) should be exposed and dealt with in a systematic way, by removing the root causes. The Kanban-system of Toyota is a good example of a system which exposes bottlenecks and problems. When there are relatively little Kanban-cards in circulation, you will quickly see what are the most unreliable workstations or processes. During the last decades, many Western companies implemented the technical side of Lean, by applying tools like value stream mapping, 5S, SMED and Kanban. Unfortunately, after a few successful improvement ‘projects’, old habits and wasteful processes often returned. Why is it so difficult to stay Lean? In recent years, it was recognized that the answer is a lack of attention to the organizational side. ‘Lean is about process ánd people’, is a quote you often hear in this context. Ment is that Lean will only truly work, when it becomes embedded as a method of thinking and acting in the genes of every employee. Ideally, everybody, everywhere, everyday should help to increase the value stream more and more. Creating such a culture of continues improvement, how do you do that? Until about five years ago only relatively vague hints were given, like: ‘see to it that top management is involved’, and ‘good communication is crucial’. Fortunately, a number of good management books were published recently, like The Lean Manager, Managing to Learn en Toyota Kata. These books describe the best practices for the organisational side of Lean. Focus is on ways to open up and stimulate the creative power in all employees. To conclude: Lean was first defined as a method to reduce waste, then the emphasis shifted towards maximizing the value stream. Today, Lean is redefined again as an approach which transforms all your employees into problem solvers, working on a common goal. That goal has remained the same: minimal waste and maximal value creation, as seen in the view of the customers. Modern vision on the organizational side of Lean: Team leaders solve unpredictable obstacles on the route to improvement by trial and error, with rapid cycles of Plan-Do-Check-Act. (source: Toyota Kata, Mike Rother). In this book Toyota Kata Mike Rother states that a company needs a Vision first, this is an ideal state to be reached in a very distant future. According to Rother, for Toyota this utopian vision during the last fifty years was (and is): a One Piece Flow of products towards the customer, in sequence, on demand, with zero defects. Note that in this Vision of Toyota there is no room for intermediate stock, which sheds a new light on Kanban. This tool should be seen as a temporarily solution, to expose disturbances in the flow. People who do not know that, sometimes calculate an optimal number of Kanban-cards for a process loop. That way, every route to further improvement (towards the Vision with no Kanban-cards at all) is cut off. Let’s return to the Vision. This gives direction, but says nothing about how to improve. This vagueness is however good, since the improvement path is unclear territory anyway. Because the route to the Vision is long and misty, team leaders within Toyota are challenged to reach a Target Condition for their process, which brings it a tiny bit further towards the Vision. These Target Conditions, attainable within a period of several months, serve as pickets on an a priori unknown route towards improvement. That way, every team leader knows exactly how he or she can contribute to improvement today. In Western companies this often is not the case. Even if the direction is known, in contrast to Toyota Kata, westerners determine usually in advance how the improvement should be realized. This gives problems when unexpected things occur, like a sudden change in product demand. To cope with these unexpected things, teamleaders within Toyota improve their processes with small and iterative steps, by trial and error, using cycles of plan-do-check-act. This has the advantage that they can learn on the way upwards, and adapt their approach if necessary. Rother calls the behavior of the teamleaders to climb so to speak a mountain in the dark the Improvement Kata. Kata is a Japanese word for ‘form’; it is also used to describe routine movements during martial arts. 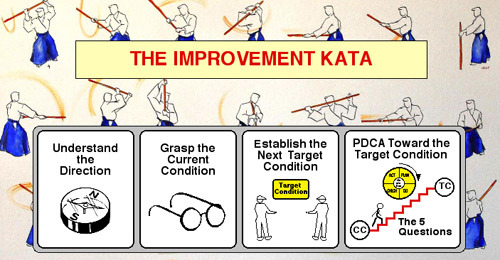 The Improvement Kata is a set of behavior guidelines. It is not learned in a classroom but by doing, through repeated practice. Thereto every teamleader in Toyota is coached by a more experienced person, a personal mentor or sensei. Teaching how to improve is done via a mentor/mentee dialogue, which Rother calls the Coaching Kata. The teaching process has the aim to keep the mentee within the corridor of the Improvement Kata, by asking Socratic type of questions. Today, Lean principles are used extensively outside manufacturing. On the photo an improvement team in the Dutch hospital Reinier de Graaf Group. Toyota turns out to be an organization in which everyone is a problem-solver, guided by a coach. This explains their deeply embedded culture of continuous improvement. To structure the dialogue between a problem solver and his or her mentor, often a piece of paper with the size of an A3 is used. On this paper, the problem analysis is put down by the mentee. Next, the A3 is rewritten several times after hints from the mentor. 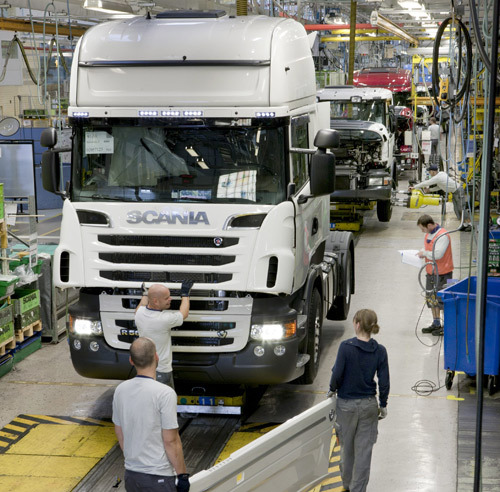 An A3 can for example be revised after a visit to the Gemba which yields new information, or after receiving feedback from the workers about a possible improvement solution presented on the A3. This way, the A3 becomes a report of a journey, from the problem description to the suggested counter measures and the implementation of those ideas. How A3 reports are used is described in detail by John Shook in Managing to Learn. That book and others like the already mentioned Toyota Kata and The Lean Manager describe the best practices concerning the organizational side of Lean, like it was done much earlier for the technical side in books like The Machine that Changed the World. That the state of the art regarding the organization of Lean is now laid down is good, since many of the described approaches are applicable in almost every organization (Lean or not). In addition, a review of the current knowledge is indispensable to make a further evolution of Lean possible. When you start with Lean, it is important to realize that you will become part of a long tradition of trial and error. Therefore you should not copy some kind of ‘Lean template’, but develop your own Lean system . And maybe, in the long turn, you can even contribute to the further evolution of Lean! There is a nice challenge ahead in that respect. The books mentioned in this article stress the need for improvement in small steps, to make it possible to respond to uncertainties. However, for trail-blazing innovation, like the replacement of the horse and carriage with the automobile, you also need a more strategic approach. This is for example found in improvement methods like the Theory of Constraints and (Design for) Six Sigma. How to combine these approaches? Lean principles are applied in an increasing number of organization types. As described in the main article, Lean evolved to cope with situations other than mass production, like the manufacturing of tailor-made products. A typical example is the now widespread utilization of Lean in hospitals. 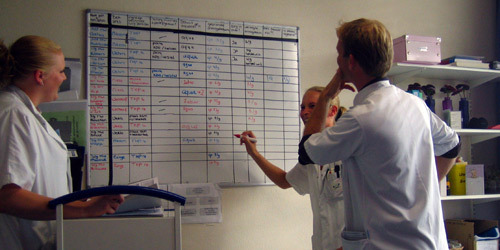 In care and cure, the focus lies on the application of value stream mapping, to reduce the throughput time and the length of stay of the patients. Besides that, improvement boards and ICT-applications are used to make problems and bottlenecks visible. A typical example is an alert when a departure from a planned cure path occurs. Lean cannot be copied from one organization to another without making adaptions, even if both companies operate in the same industry sector. Therefore it is necessary to develop your own flavor of Lean. As a rule, this becomes more difficult when you have less repetitive processes. On the other hand, when you succeed to apply Lean in such a situation, it will be harder for your competitors to copy this. An example of a relatively new Lean application is the optimization of administrative processes. Like products, also documents can strongly benefit from improving their flow through an organization. One of the characteristics of a Lean transformation, is that this usually starts with a standardization of the existing processes. This forms the base for improvement, by developing improved standards. The goal is to increase the value stream towards the customer, resulting in a higher throughput and less wasteful activities. It is often thought that design to order production cannot be made Lean. After all, in that case the production steps cannot be standardized as point of departure for improvement. However, what is forgotten is that in this case the process of designing and producing things can be standardized. One example of a Lean-derived management approach for design to order is the Scrum-method. It is a way to develop made-to-measure software products, by doing this in small PDCA-like steps, with frequent feedback of the customers. Lean cannot only be applied to design software, it can also be used to improve maintenance processes, designed to fulfill specific needs. Stork Technical Services is an asset integrity management company, specialized in maintaining (petro)chemical and power plants, including turnarounds and relocation. To maintain machines like turbines, it is diagnosed first which maintenance and replacement parts are needed, then these parts are bought or made by Stork. So, each maintenance process is tailor-made. It turned out to be possible to highly reduce the amount of rework needed to complete such a process. An example of rework is making new parts when the ones originally ordered or made, do not fit. The amount of rework was reduced by standardizing the transfer of information and documentation between the sales and project managers, the production workers and the buyers. In their article “Lean Knowledge Work” (Harvard Business Review october 2011, downloadable at the HBR-website ), Bradley Staats and David Upton discuss the successful application of Lean at Wipro Technologies. Based in India, this company develops made-to-measure software solutions like printer drivers. The introduction of Lean within Wipro resulted in shorter delivery times and lower costs. Staats and Upton, assistant-professor at the university of North Carolina and professor at the university of Oxford respectively, formulate six rules for the application of Lean in companies with knowledge-driven work. Left over is the work for which tacit (decision-making) knowledge is needed, locked inside the workers heads. First of all, also a remarkably amount of this work can be made explicit and put into protocols. A good example is the peer review process of Wipro, in which the quality of newly written software code is assessed by a colleague. In the end, it even turned out that a computer could do this! Of course there always remain parts of the work which do not contain repeatable steps. In that case the work itself cannot be made Lean, but the way the knowledge workers interact with each other can! Who communicates about what and how often this is done can for example often be standardized. As mentioned earlier, besides Wipro also Stork Technical Services is successful with this approach. At Wipro, making a realistic production planning with feedback also contributed highly to make this company Lean. Note that the Scrum-method, quoted before but not mentioned in the HBR-article, does exactly the same.